This interesting name is of Norman French origin, introduced into England by the followers of William 1 after the Conquest of 1066. The surname derives from an Old Germanic personal name, "Amalric", composed of the elements "amal", bravery, vigour, with "ric", power, which was adopted into Old French in a great variety of different forms, for example: Amalri, Amalric, Aumari, Aumaric, Amauri, Emaurri, Haimeri and Ymeri. The personal name is recorded in its Latinized form of "Amalricus" in the Domesday Book of 1086, while the later English forms of the given name include Emmeric (1241, Somersetshire) and Emery and Aymery (1269, 1278, ibid.). 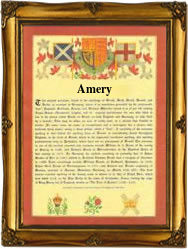 The profusion of personal name variants is reflected in the number of surnames that have been generated from them, ranging from Amery, Amory, Emary, Emery, Emory, Embery, Emeric, Imbery and Imery, to Hemery and Hembry. Among the recordings in London Church Registers are those of the christening of Thomas Emery on November 26th 1561 at St. Augustine's, Watling Street, and the marriage of John Emery and Mary Cowert on January 16th 1661 at All Hallows, London Wall. The first recorded spelling of the family name is shown to be that of Roger Hemeri, which was dated 1182, in the "Cartulary of St. Mary's, Clerkenwell", London, during the reign of King Henry 11, known as "The Builder of Churches", 1154 - 1189. Surnames became necessary when governments introduced personal taxation. In England this was known as Poll Tax. Throughout the centuries, surnames in every country have continued to "develop" often leading to astonishing variants of the original spelling.